When she came through the door, she handed me a small wooden charm. It was a colorful shamrock shape, tied with red and white striped string. “What a lovely tradition!” I said, as I took it from her hands. 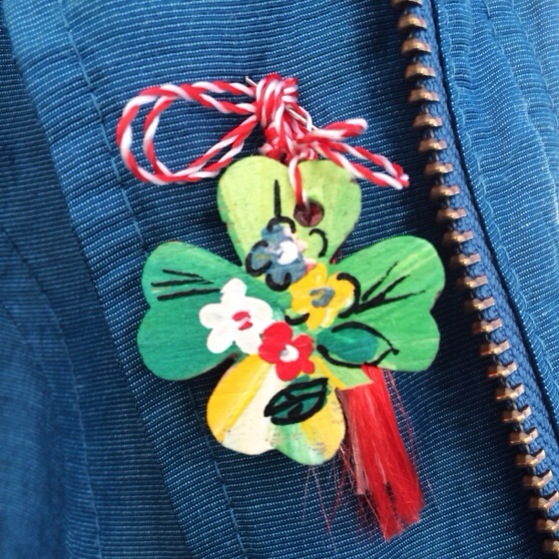 After the party I pinned my charm to my coat as a sweet reminder of the couple I had just met from Romania. The Martisor, a spring token, a tiny adornment tied with a red and white entwined cord presented on March 1, celebrates the arrival of spring. It is believed to bring joy. Friends, I am all about traditions that bring joy. Each day, when I put on my coat and walk out into the blistery March winds, I smile when I see The Martisor. My spring token from a new friend. What do you do to celebrate spring? My favorite memory of celebrating spring is with you when we lived in Seattle. Our picnic with our babies in the UW quad filled with blossoming cherry trees and then heading to Pike’s where they hand out daffodils on the first day of spring! To this day I feel I like I should go there to know it is spring!! Love you! That is my favorite spring memory too Laura! I saw several pictures on FB of the quad from friends who were there this year! I miss our Seattle Springs together!! One year we should plan to meet in Seattle for the first day of spring for old time’s sake! Thanks so much! Happy Spring to you friend!